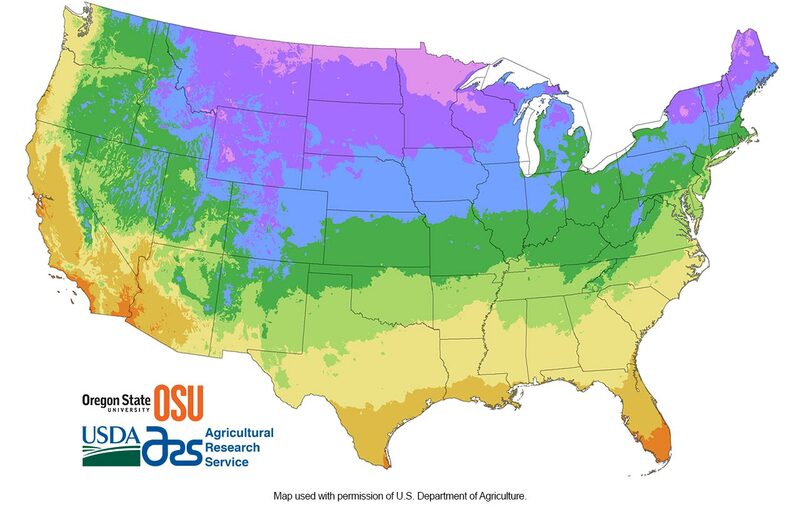 If you look at most plant labels, you’ll see a zone designation, such as “Hardy to Zone 7.” These labels refer to the USDA Plant Hardiness Zones, which divide North America into zones based on estimates of the minimum annual temperature. A plant is considered “hardy” if it will survive the winter in that particular zone. Each zone represents a 10 F temperature difference and is then further subdivided into “A” and “B” according to 5 differences. Zone 1 is the coldest and is subject to frost year-round while Zone 11 is the warmest and completely frost-free. If a plant is “Hardy to Zone 7,” that means it should survive the winter in Zones 7 and warmer. Once you know the hardiness zone you live in, you can choose plants that will survive the winter in your area. Learn more at USDA. Microclimates are small pockets of climate variations that differ from the surrounding climate. Wind – Strong winds can decrease temperatures and damage trees. You may want to plan for a windbreak in a specific location to provide protection. Slope – Cold air can be like an invisible flow of cold water, which is why a valley floor is typically colder than higher up on a slope. But you can use slope to your advantage. If you’re in a warmer area and your trees need more chill hours, plant in the cooler valleys. If you have a colder climate and want to ward off frost damage, make use of available slopes. Thermal mass – Rocks and water absorb heat during the day and share it with nearby plants during the night. So a stone or brick wall can lend warmth to a late-fall producing fruit, just as jugs of water help warm a greenhouse. A pond can act as a heat sink during summer and a cold sink in winter. Sun – There’s good reason the winter outerwear company is named “The North Face” – you need those down- filled coats when you’re in a cold, north-facing area. And that idea can help guide your plant location. A Northern aspect would be a good spot if your fruit trees need more chill hours. Conversely, a Southern aspect provides more warmth. And an East-facing location enjoys softer morning sun, while a Western- facing spot basks in hotter and more intense afternoon rays. Sunset Gardening has developed a different system of climate zones that is more informative, taking into account microclimate factors such as frost-free days, humidity, prevailing winds, effects of ocean, elevation and regional weather patterns. Learn more at Sunset. These are the number of hours between 32°F and 45°F in your climate zone from November to mid-February. Temperate fruits need go through anywhere from 100 to 1,400 chilling hours to bear fruit the next season. Gauging cumulative chill and matching varieties for your area is more of an educated guess than an exact science, as low temperatures vary considerably within a climate zone and from year to year. Chilling requirement is a concern for USDA zones 9B and 10, predominately in Southern and coastal regions where chilling hours average 100 to 600 per year. If you are within this area, take note of the chilling requirements listed for fruits and choose accordingly. Most of Northern California receives between 800 and 1,500 chilling hours per year, which is sufficient for most fruits. Persimmons, almonds, olives, berries and pomegranates all have low chilling requirements. Low chill varieties are available for apples, pears, apricots, nectarines, peaches and plums. Use the map to see if you are in a low chill area and estimate your amount of winter chill.